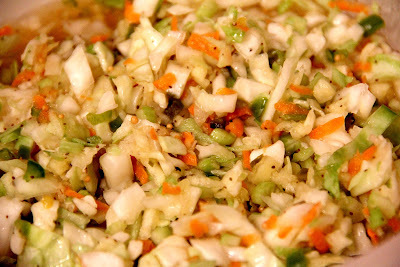 A basic vinegar coleslaw made with the addition of sweet apples and a touch of jalapeno for heat. 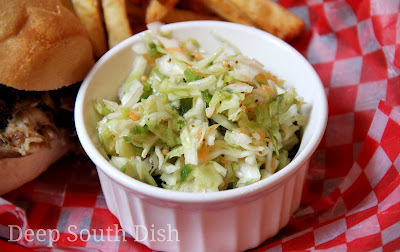 For those who were asking, this is the coleslaw that was pictured with the most recent pulled pork recipe I posted. There are essentially two basic schools of taste on coleslaw - one creamy and usually mayonnaise based, and others, like this, more heavily vinegar based. Considering that it's apple season and apples are plentiful right now, I decided to add in some grated apple to make it a little more seasonal. You may not automatically think to use apple in a coleslaw, but, like pineapple, the sweetness of the apple is an especially perfect contrast against the vinegar dressing. It's an excellent flavor enhancement for this time of year, making it a happy addition for those of you who do serve coleslaw at the holidays. Yes. I am old enough to be a grandma three times now, yet even with those years of life experience under my belt, I still learn something new pretty regularly. Though my family didn't, seems there are quite a few folks who traditionally have coleslaw on their holiday table. Who knew? Speaking of that, were you also aware that apples can be frozen? The good folks over at Pick Your Own are a great resource that I recommend all the time for home preservation instructions - whether it's canning, drying or freezing. I certainly don't believe in re-inventing the wheel either, so I'm much more happy to guide you to other websites and blogs who specialize in certain areas rather than trying to prove I know it all - I certainly don't and never will! Pick Your Own will show you step by step how to preserve apples in the freezer and thankfully, none of them involve salting, an old method of preserving that through osmosis, is more likely to result in a rubbery, salty apple than anything. According to them, the best methods to freeze apples are to use a syrup pack, or a sugar or dry pack - depending on how you later intend to use them. To hamper browning, they recommend ascorbic acid, a powdered form of Vitamin C we know most commonly as Fruit Fresh, that can be found at your store near the canning supplies. "A Syrup Pack is preferred for apples to be used for uncooked desserts or fruit cocktail. A sugar or dry pack is good for pie making. The dry pack can be used any way. The sugar and syrup pack methods are less likely to brown or have freezer burn." Even though we can find apples pretty much year round and preservation isn't that much of an issue for us now, it's nice to know there are some freezer options. Fresh apple season is still probably one of my most favorite parts of Fall and I just love the idea of an apple slaw. If you have a batch of pickled onions made up, chop those up and use them in place of the grated onion, and, if you like a little heat, drop in some chopped jalapeno for a nice kick. Give it a try. Who knows, it might just become a new holiday tradition! In a saucepan, bring the vinegar and sugar to a boil; continue boiling until sugar is well dissolved. Let cool slightly, stir in the celery seed and mustard seed; set aside. Place the chopped cabbage in a large bowl and add the carrot, bell pepper, celery, onion and jalapeno; toss. Shred apples on the larger holes of a grater; add to the cabbage mixture, toss and immediately pour the vinegar mixture over the cabbage mixture; stir. Taste and add salt and pepper as desired. Refrigerate for several hours before serving, stirring occasionally. Cook's Notes: For the holidays, use half red cabbage and include a handful of dried cranberries for color. A bit of chopped pecans or walnuts would be a great addition too. A well drained 2 ounce jar of pimentos makes a nice substitute for using red bell peppers. Substitute pre-shredded angel hair cabbage if desired. Images and Full Post Content including Recipe ©Deep South Dish. Pinning and sharing links is welcomed and encouraged, but please do not repost or republish post or recipe text elsewhere such as other blogs, websites, or forums without explicit prior permission. All rights reserved. Apple cole slaw sounds interesting. I've got everything I need to make the apple enchiladas this week. Can't wait to see how they turn out. Hope you like them Eva! I used to have a recipe like this that I made all the time when my girls were little, then I lost it. This looks perfect, especially like the spicy addition (or at least my husband will especially like it)! It's pretty good even without the jalapeno Pam - enjoy! This would be great for a tailgate party. No mayo. Perfect with pulled pork sandwiches too. Thanks. Yes it would Lita & you're welcome! My daughter once put too much onion in her slaw, and her Slovakian mother-in-law told her to grate some apple into it. It worked like magic! Not only did the overpowering flavor of the onion get balanced out, but the strong onion smell lessened as well. Fantastic tip Marcia - thanks!! The next pork shoulder that I make, I am going to smoke it with apple wood and make this for a side/condiment. Pinned it. I think that'd be perfect Chris!